Jerry Dworkin, BBA '75, makes a bold claim about his collection of 111 Mike Piazza baseball cards, which, with the exception of a select 24 (more on those later), are stored in a secret safe. "This is the most unusual collection of a hall of famer, or future hall famer, ever," Mr. Dworkin says. Mr. Dworkin's collection is built around a specific Mike Piazza baseball card: Mike Piazza as a Florida Marlin. For five games in May 1998, after he got traded from the Los Angeles Dodgers and before he got traded to the New York Mets, Mr. Piazza played for the Marlins. The to-be Hall of Fame catcher—he'll be inducted this summer—went 5-for-19, with a triple and five RBIs on a team that would lose 108 games. It was an unremarkable stint on a terrible team. And yet, thanks to a historically robust baseball card industry that has since shriveled, 124 different iterations of Florida Marlins Mike Piazza cards were made. Some of them were mass-produced. Others were "one-of-ones," meaning only a single card of a particular design was ever printed. 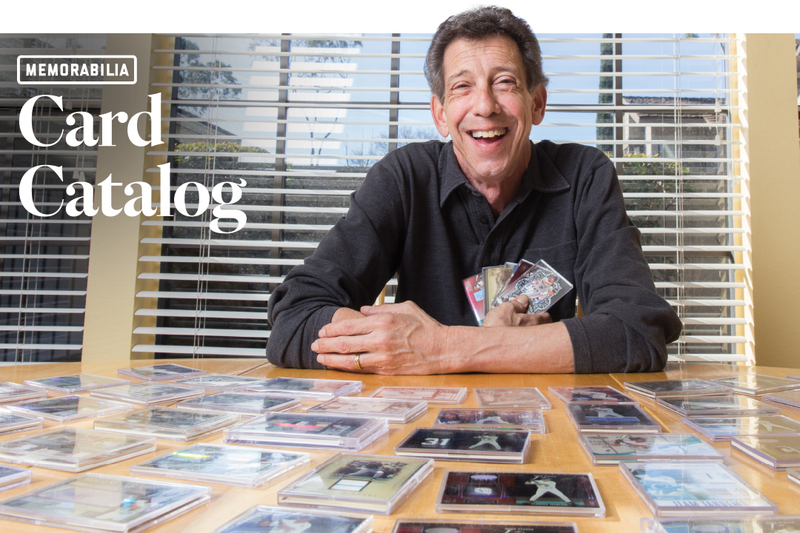 Tipped off by the cousin of his then-girlfriend to the cards' existence and intrigued by the novelty of a Hall of Fame player making a cameo on a team, Mr. Dworkin—a man who'd never collected anything and was, at best, a casual sports fan—started collecting. "Seventeen years ago, I jokingly—somewhat—said, 'One day my collection is going to be exhibited in the Baseball Hall of Fame,'" says the 62-year-old attorney. "It was a total pipe dream. Never did I really think I would achieve that goal." Ever prescient, Mr. Dworkin was right, not only about the enduring novelty of the cards but also their value. On Nov. 7, 24 of his 111 different Mike Piazza Florida Marlins cards went on display at the National Baseball Hall of Fame and Museum in Cooperstown, N.Y., part of a 300-piece exhibit spread across two big rooms on the second floor. "When we were looking for something that would be the perfect snapshot of baseball cards in the 1990s, we contacted Jerry," says John Odell, MA '95, the Hall of Fame's curator of history and research who knew about the Piazza Marlins cards because Mr. Dworkin had previously contacted the Hall of Fame. Mr. Odell had also read about Mr. Dworkin's collection in The New York Times. The permanent exhibit, "A Whole New Ballgame," documents baseball from 1970 to the present, with an emphasis on how fans interact with the game, particularly through commercial ephemera. In the collection are beer cans, cereal boxes, candy bars and, of course, baseball cards, which were never more popular than they were from the mid-1980s to late 1990s—the boom being the result of an antitrust lawsuit in 1981 that destroyed Topps' monopoly and opened the market for half a dozen upstart card companies. By the early '90s, baseball cards were a $1 billion-a-year industry, and manufacturers flooded the market with billions of cards. This is how a player's meager five-game stint with one team produces 124 separate cards. The baseball card industry would implode in the late '90s because of an oversaturated market. The 1994 strike and subsequent steroid scandal didn't help, either. The industry has yet to recover—as of 2008, yearly revenues were about $200 million—and the odds aren't good it ever will, making Mr. Dworkin's collection, which he loaned to the Hall of Fame on a year-to-year basis, that much more unique, that much more niche. 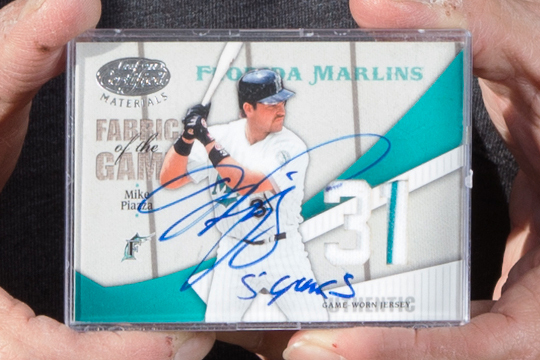 The Philadelphia native says he's spent more than $10,000 acquiring his Mike Piazza Florida Marlins cards and as much as $1,000 on a single card. He's also procured other Marlins-related memorabilia from Mr. Piazza's Miami layover, including the negatives of unused Topps baseball card photos. Mr. Dworkin, who lives in Irvine, Calif., also has an autographed copy of Mr. Piazza's autobiography, which the former slugger signed during an appearance at a Pasadena, Calif., bookstore in February 2013. "When I got up there, I said I was the Marlins guy," Mr. Dworkin says. "He was aware of me and he was aware of the [New York Times] article, and I said to him sign the book, 'Go Marlins.'" It's the only time the two have met, although Mr. Dworkin repeatedly wrote to David Letterman, lobbying to be on the Late Show with Mr. Piazza. It was part of Mr. Dworkin's Great Solicitation of 2012, when he mailed information packets to roughly 30 media personalities and outlets—including the Times (which ran a story on him on Jan. 1, 2013) and the Baseball Hall of Fame. "I'm willing to take a shot for a buck or two," Mr. Dworkin says, laughing.